A U OF M-TRAINED DENTIST and entrepreneur who attained global success as the originator of modern implant dentistry has made a landmark gift to his alma mater. 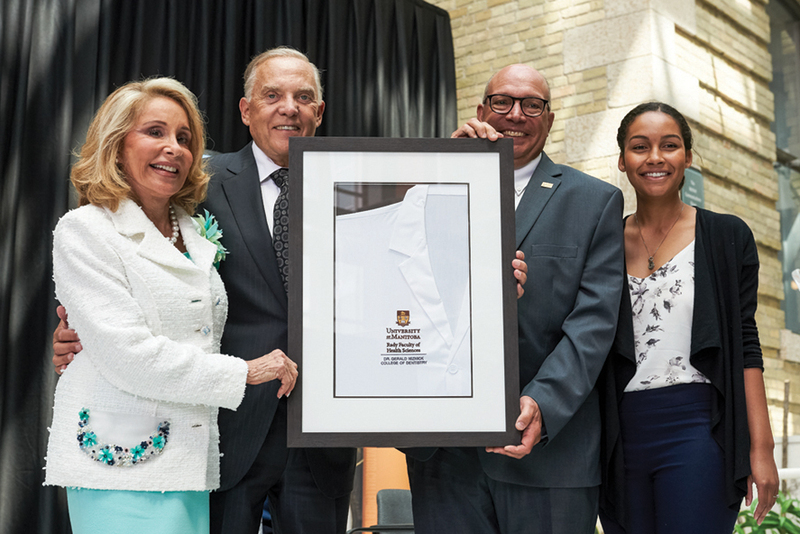 On May 29, 2018, Gerald Niznick [DMD/66, D.Sc./02] and his wife, Reesa Niznick, announced their historic donation of $7.5 million to the College of Dentistry through the U of M’s Front and Centre campaign. In recognition of their transformative gift – the most generous in the college’s history – the university has renamed the college the Dr. Gerald Niznick College of Dentistry. “The University of Manitoba dental faculty instilled in me a deep appreciation of the trust patients put in us,” Niznick told a large audience that gathered for the announcement in the Brodie Centre Atrium on the Bannatyne campus. The Niznicks’ gift will support excellence in teaching, research and community engagement. It will enhance clinical training space, fund special initiatives that enrich the community’s health and well-being, and create reliable endowed funding for the college. “Our alumni continue to make an important impact on the health of our nation, and in Dr. Niznick’s case, internationally,” said Dr. Anthony Iacopino, dean of the Dr. Gerald Niznick College of Dentistry. “We are honoured that Dr. Niznick has chosen to invest today in the instructors, support staff and students of dentistry who will carry on that legacy of impact and innovation. Niznick recalled that two years ago, he reunited with classmates from the close-knit Dentistry Class of 1966 to celebrate their 50-year reunion. Their class was the fifth one to graduate from the college, which produced its first dentists in 1962. 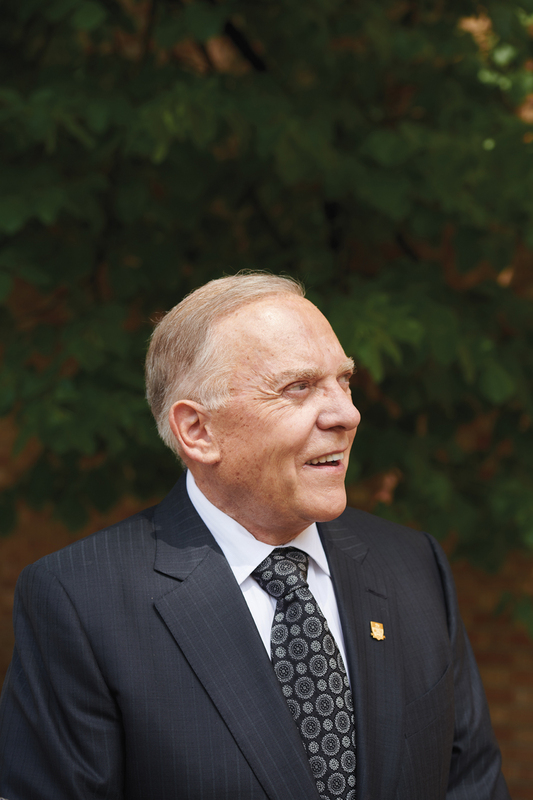 The renowned prosthodontist and inventor of dental implant technologies wanted to make a significant donation, he said, to show his respect and appreciation for the strong foundation that U of M gave him. He and his wife, who have two daughters and six grandchildren, live in California but have strong ties to Winnipeg’s North End. “We want our grandchildren to know where we came from and what our values are,” Niznick told the Winnipeg Free Press. “This reflects, really, what our values are – to give back to the community. Recent graduate Natasha Holder [B.Sc.(Hons. )/14, B.Sc.(Dent. )/18, DMD/18] said the Niznicks’ investment will enable students to deliver more care to disadvantaged community members. To mark the occasion, Holder and Iacopino presented the Niznicks with white coats embroidered with the college’s new name, as well as a framed, commemorative white coat. With the Niznicks’ $7.5-million donation, U of M Vice-President (External) John Kearsey announced that the Front and Centre campaign had reached a new milestone of $466,495,719, contributed by 59,000 donors. The goal is to raise $500 million. Born to immigrant parents, Dr. Gerald Niznick grew up in Fort Frances, Ont., before moving to Winnipeg to attend high school, then the U of M. He and his wife, Reesa, married after his second year of dental school. He graduated from the U of M with his dental degree in 1966, then earned a master’s in prosthodontics at Indiana University. He started his dental practice in Los Angeles in 1968. In the 1970s, when dentures and bridges were the only options for replacing missing teeth, Niznick started searching for a better alternative. Unable to find a reliable dental implant, he decided to invent one. By 1982, Niznick had developed and patented his own implant design, the Core-Vent Implant System. Within less than a decade, it became the most widely used dental implant system in the world. By the end of the 1980s, he had developed four different implant designs. Through innovative business practices, such as all-in-one packaging, he could sell his implants at about one-third of the price that major companies charged. Niznick was also a pioneer in 24/7 manufacturing and using the Internet for ordering and technical support, all of which made implant dentistry more affordable for dentists and patients. He contributed significantly to dental science by conceiving and funding the largest dental implant study in the world, involving 900 patients at 32 Veterans Affairs centres in the U.S.
Today, he holds more than 30 U.S. patents. He has personally trained more than 10,000 dentists worldwide in dental implant procedures. In 2002, the U of M awarded Niznick an honorary doctor of science in recognition of his achievements. In 2007, the Alpha Omega Dental Fraternity presented him with its highest honour, the Achievement Medal. This past May, he was honoured at the Jewish National Fund Negev Gala in Winnipeg.